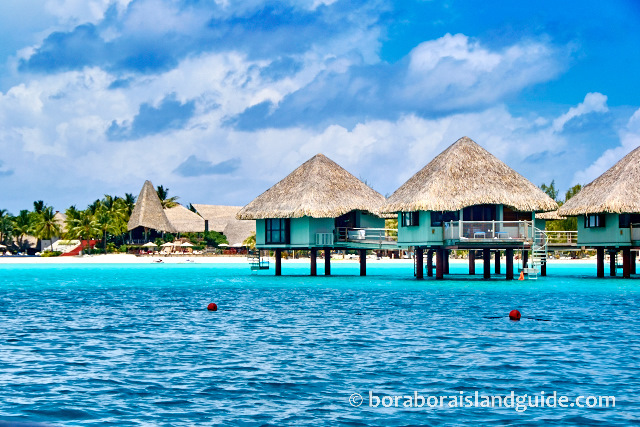 Here are the highlights of the amazing Bora Bora resorts to help you decide where to stay on your Bora Bora vacation. We've sorted them into their star rating, from five star resorts to three star hotels. 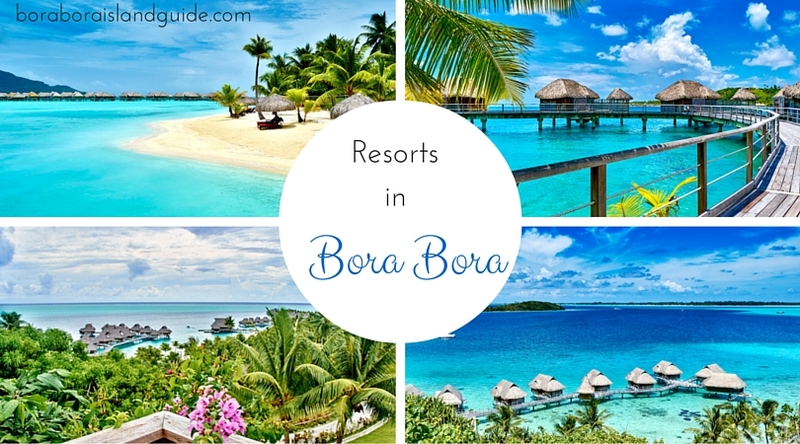 Need our help choosing from the Bora Bora resorts? Or want help planning the vacation of a lifetime? We can show you what to keep in mind while choosing between resorts. 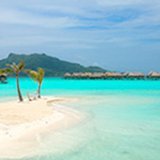 Bora Bora is unlike any other vacation, let us show you some of the ways you can create the best vacation. 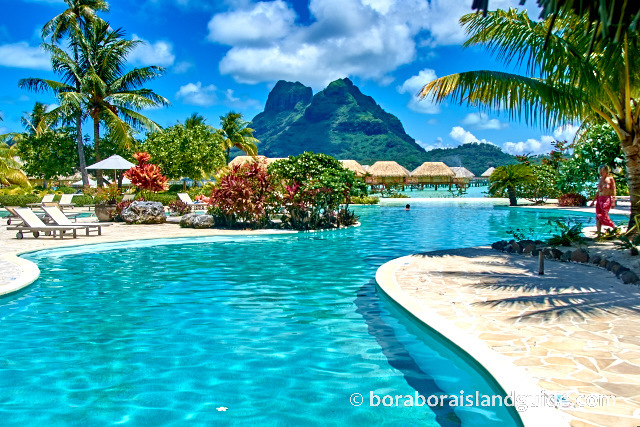 Maybe you want to know what the snorkeling is like at each Bora Bora resort? 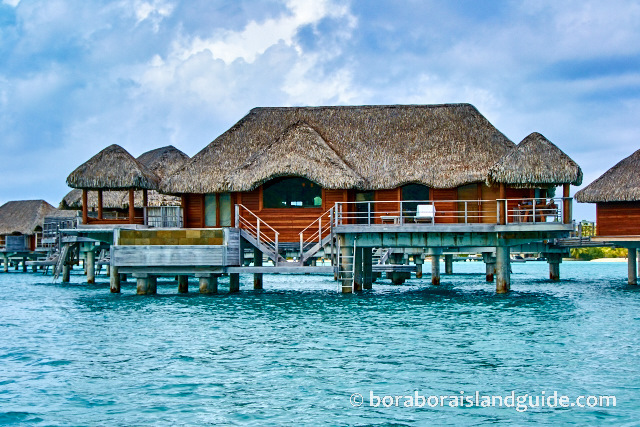 If you are looking at Bora Bora overwater bungalows, you must know these 12 essential tips that we have learned from experience. If you are travelling to Bora Bora with kids, here are the top 3 family friendly resorts in Bora Bora. 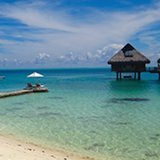 Then, speak to our Tahiti vacation specialists, for some extra advice and make sure you contact them when you are ready to book your Bora Bora resort. They have wholesale negotiated rates, but offer concierge like service. Aiming for opulence, the St Regis Bora Bora opened in 2006 with the largest over water bungalows in Tahiti and a butler service to pamper guests. 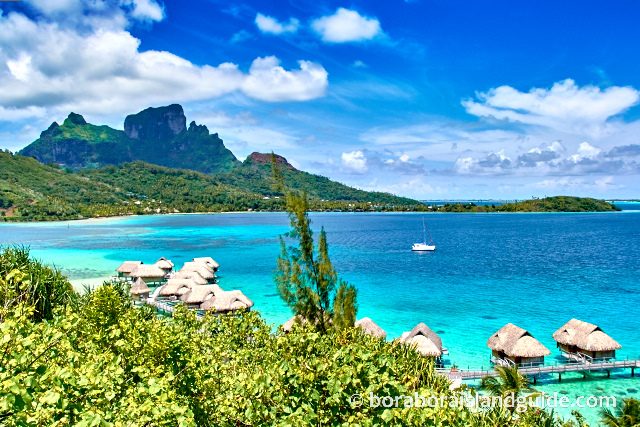 As it's on a thin motu fringing the lagoon, it has views to Bora Bora Island and the ocean. The décor is more European than other Bora Bora resorts. It's huge, luxurious, over water villas have several areas of glass flooring for lagoon viewing. The triangular motu which connects the over water bungalows has a romantic couples pool with private cabanas. The exclusive on-land villas have a private pool and either front the lagoon's beach or the Pacific Ocean. A beautiful spa sits on a secluded motu surrounded by lagoonarium. The gorgeous Lagoon Restaurant has a world famous chef. There is a children's indoor room for creative play. The Conrad has a unique, private location on the back of volcanic Motu Toopua. It's white sand beach is nestled in a cove surrounded by black basalt rocks and lush tropical vegetation. The Nui looks out over the bluest part of the lagoon to the reef and the open ocean. It's hill top spa has amazing lagoon and ocean views. The large, over water bungalows are decorated with precious woods and have glass floor viewing panels. 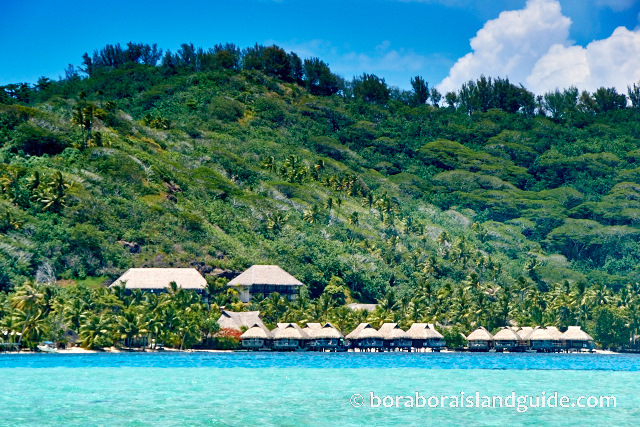 Abundant coral heads in the water around the bungalows provide the best resort snorkeling in Bora Bora. The large, on-land villas sit up on the hillside or among lush gardens. The two story block of lagoon view suites is close to the beach and main restaurant. Two huge Presidential overwater villas are were the first double story over water bungalows in Tahiti. The newer Intercontinental Bora Bora Thalasso resort is in a prime position on a motu looking across vibrant, turquoise lagoon to Mt Otemanu. All accommodation is in large luxurious over water villas and 31 of them have stunning Mt Otemanu views. The modern, elegant simplicity of their decor incorporates creative artworks on walls. They are perched above warm, calm, swimming-pool-like lagoon. This turquoise water is showcased by a wall of glass window in each room and glass flooring under the coffee tables. The Thalasso has the Deep Water Spa and uses unique mineral-rich deep ocean water in treatments. Regular boat connections with the Moana on the main island give the benefits of a secluded motu stay with views, plus easy access to restaurants, shops and Matira Beach. 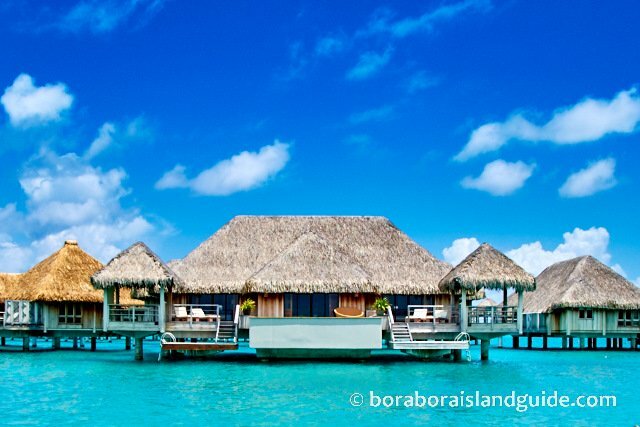 This newest (2008) Bora Bora resort is Polynesian inspired with ultra-modern comforts. Located on a motu fringing the lagoon, it faces Bora Bora Island. It's large, luxurious over water bungalows offer beach, lagoon, resort and mountain views. The private beach front villas with 2 or 3 bedrooms each have a pool, so are ideal for families. Kids clubhouse has programs for 5 to 12 year olds and Chill Island provides a safe, private area for teens. The 54 acres of resort grounds are great for exploring. There is ample privacy for couples, except during peak holiday times. The beautiful cathedral-like spa is a feature. A concierge is always available to take care of details like tours or dinner reservations. 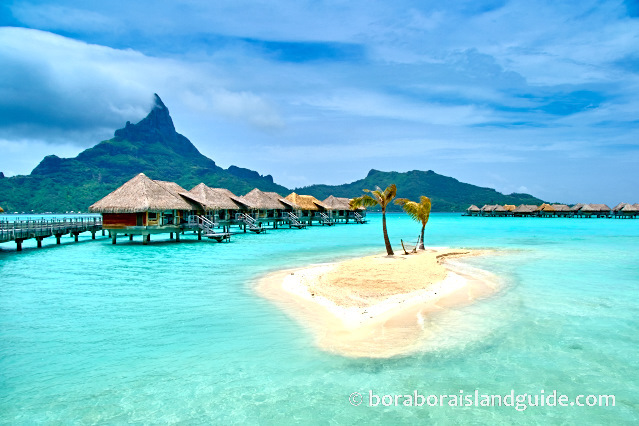 Read our Four Seasons Bora Bora review. A 2010 renovation with a tropical theme transformed the le Meridian Bora Bora. It's medium size Polynesian bungalows have sleek, modern, interiors. Le Meridien over water bungalows are light and airy, with large glass floor panels for lagoon viewing. Some of the beach villas are on their own private beach. The others have separate bedrooms plus a private infinity pool so are great for families. This resort is located on a long motu with wonderful views across the turquoise lagoon to Bora Bora Island and Mt Otemanu. An inner lagoon, with coral and tropical fish, has been created to provide snorkeling for guests. The turtle sanctuary here gives you the opportunity to swim with these intelligent creatures. 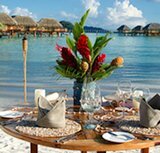 Situated on Motu Tevairoa, the Pearl Beach Resort Bora Bora displays authentic traditional Tahitian architecture and decor. It's beach is like a turquoise, salt water pool and overlooks the majestic peaks of Mt Otemanu and Mt Pahia. It's medium size over water bungalows blend modern amenities with detailed Polynesian decoration and include lagoon viewing under the coffee table. For couples wanting more privacy, or families needing space, there are Pool Suites and Beach Suites with enclosed terraces. These have a fascinating island ambiance and are set in private gardens. The lush, natural gardens are a feature of this resort and pathways wind through them to a variety of activities, including a mini golf course and a serene spa. The Bora Bora Sofitel Marara Beach, on the main island, has combined with it's exclusive Private Island resort, a 2 minute boat ride across the lagoon. 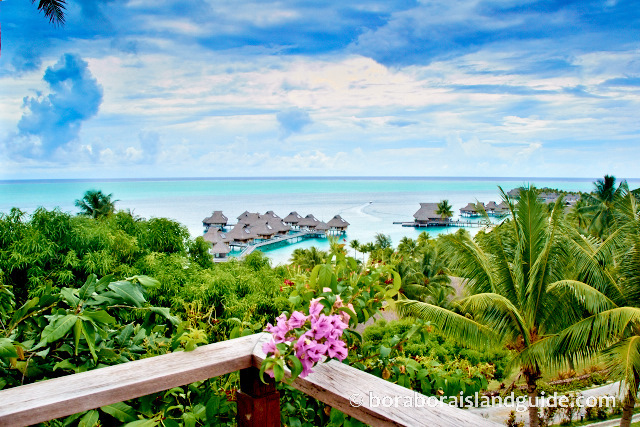 This charming resort offers a distinctly Polynesian experience. All of it's bungalows are a medium size. A mix of warm woods, woven fibers and colorful fabrics, creates a tropical island mood. Sofitel Over water bungalows have a glass floor section. On the main island they are in shallow water with vistas (similar to the beach bungalows) across the lagoon. Those on the Private island are in deeper water and face up the lagoon, like the on-land villas here. All restaurants and bars have gorgeous water views and a hill top deck has a blissful 360° panorama. 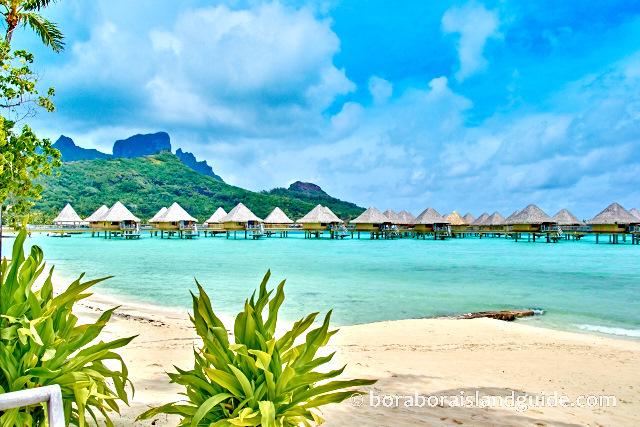 The Bora Bora Sofitel is in a great location. 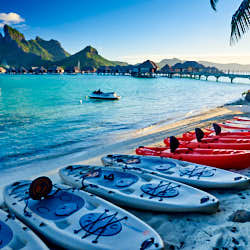 You can paddle to the best snorkeling in Bora Bora or walk to a mini-mart, restaurants and Matira Beach. Le Moana delivers an authentic Polynesian ambiance. It's meticulously updated, medium size bungalows utilize local materials and craftsmanship in their attractive décor. The over water bungalows offer a choice of outlooks and include a glass section under the coffee table for lagoon viewing. The beach villas have a wonderful aspect. Le Moana is at the southern tip of the main island of Bora Bora. The lagoon is shallow here and although the resort faces the reef and open ocean it also has some striking Mount Otemanu views. It's position is convenient for walking to nearby restaurants and shops. You can snorkel from the beach and across the road at famous Matira. A boat shuttles between the Intercontinental Le Moana and the Thalasso, so lucky Intercontinental guests can savor the best of each. The Polynesian Le Maitai has the cheapest over water bungalows in Bora Bora. These small, modest bungalows have a glass coffee table to view the lagoon. They sit on 3 short piers which extend from a white sand beach where the rustic beach bungalows are nestled among palms. The Circle Island Road divides the hotel. So the reception area is across the road where 2 large blocks of garden and ocean view rooms have been built up the steep hillside. Each basic room has sliding glass doors opening to a balcony. The top level has awesome views across the lagoon and ocean to Raiatea and Tahaa on the horizon. The bottom level overlooks exotic tropical gardens which are the highlight of this resort. You can walk to the Mini Mart, restaurants and Matira beach. For more information, read about our stay at the Maitai. Still not sure which resort is for you?